Bet you didn’t know that Powel Crosley was the first to build a production model sports car in the US. Yes, he’s not only the genius who brought us mass produced radios, appliances, and of course WLW – The Nation’s Station, but he also became famous for his Crosley automobiles. The Autorama CD represents a vintage icon mimicking the clean, streamlined stylings of a classic 1950’s automobile. From the sleek lines to the chrome grill side mounted speakers, this beauty takes you back to the days of drive-ins and diners, but adds a hint of technological advance with a CD player. Crosley’s fascination with automobiles is evident right down to the last exacting detail. 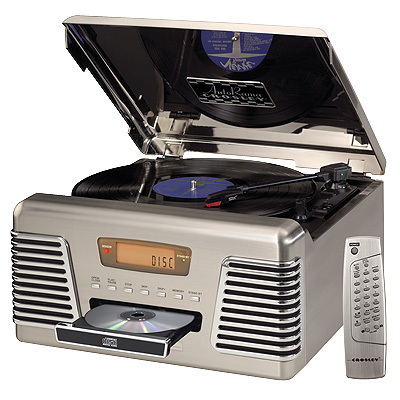 The Autorama CD features an AM/FM Radio, a 3 speed turntable, a compact disc player with full function remote control and enough sophistication to render most enthusiasts speechless. Special Note: Extra needles are available. In 1920 Powel Crosley founded the company that pioneered radio broadcasting and mass market manufacturing around the world. Dismayed with the $130 price tag for the radio receiver he promised to buy for his son’s birthday, Crosley decided to make his own. Upon successfully building a working set for only $35, Crosley was quick to spot the mass market potential. It was a simple idea - design a fully functioning radio, meticulously craft each unit with obsessive detail and precise accuracy, and of course add a measure of consideration for the wallet. Copyright © 2001- ABC Billiard Plus All Rights Reserved.